Note: The University of Minnesota School of Public Health tackles rural health issues from telemedicine use to farm equipment safety to the opioid crisis. This is the first part of a three-part series on how the school serves rural communities in Minnesota and nationwide. 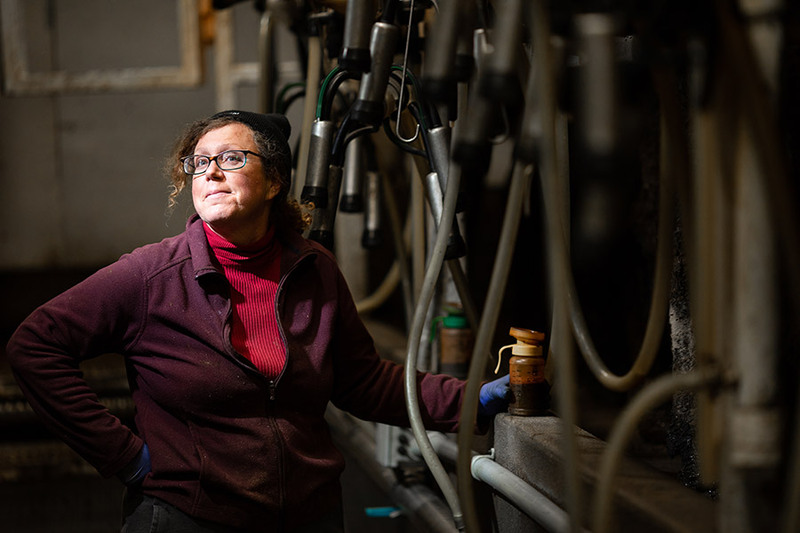 Meg Moynihan and her husband, Kevin Stuedemann, own Derrydale Farm in Minnesota’s Le Sueur County where they milk about 70 certified organic cows. In March 2016, the cooperative that picked up Derrydale Farm’s organic milk changed its route, leaving them without a buyer. Moynihan and Stuedemann dumped tens of thousands of pounds of milk for two months before they found a conventional (non-organic) processor that would buy their milk. However, the price they received dropped from $38 per hundred pounds to about $14. When the stress from this situation became too much for Stuedemann, he returned to long-haul trucking to pay the bills. Moynihan took a leave of absence from her job to run the farm alone. The situation became so overwhelming that, after talking with her family doctor about her anxiety, she began taking an antidepressant. Their story had a happy ending when, in December, another organic cooperative agreed to take their milk. But Moynihan said that the nine months they struggled to keep their heads above water were filled with uncertainty and fear. Moynihan and Stuedemann’s story is all too common across Minnesota and the rest of farm country. Stress due to uncertain weather, animal illnesses, fluctuating markets, and unforeseen disasters has always been near-constant for farmers, their workers, and their families. But in the past few years, the devastating effects of stress, including suicide, have received national attention, most recently in high profile articles in The New York Times and The Guardian. Exact numbers for suicides in farmers and farm workers are hard to calculate due to how those deaths are reported and classified, but it’s estimated that they take their lives at a rate that is three-to-five times higher than any other workers in the country. The number of farm bankruptcies in Minnesota more than doubled from 2014 to 2018. Meg Moynihan and Kevin Stuedemann’s Derrydale Farm has survived. “It’s difficult to fully understand what stress does to agricultural communities and it’s hard to count the suicides, let alone quantify depression, substance abuse, divorces, and other impacts on the family, including the children,” says Bruce Alexander, professor and head of the Division of Environmental Health Sciences and director of the Upper Midwest Agricultural Safety and Health Center (UMASH). Alexander has recently guided UMASH, a collaboration of five leading health care and public research institutions, in expanding its mission of improving the health and safety of agricultural workers and their families to include improving their mental health. “Stress can come from numerous directions in agricultural communities and may cause an incredibly diffuse health burden,” Alexander says. Stress and its consequences were major issues in American agricultural life during the early 1980s when commodity prices and exports fell, foreclosures skyrocketed, and farming suffered its worst crisis since the Great Depression. According to the National Farm Medicine Center, there were an estimated 58 suicides per 100,000 farmers in 1982, nearly twice the rate that year for white males age 20 or older. Fear is now circulating among rural communities that farmers are facing a similar grim scenario. Prices for agricultural products are falling and labor prices are rising. In 2017, farm real estate debt had reached $236.4 billion, a record high. According to a 2018 report from the Federal Reserve Bank in Minneapolis, the number of farm bankruptcies in Minnesota more than doubled from 2014 to 2018 and the trend has not reached a peak. The agricultural community is starting to suffer the effects of climate change, too. 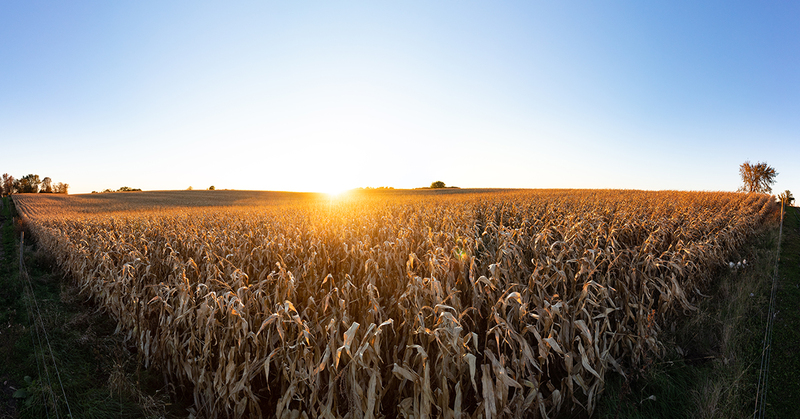 For example, a recent study showed that each day corn, soybean, and wheat crops experience temperatures of 86 degrees and higher, their yield drops by 6 percent. In the razor-thin margins farmers face in crop pricing, this is significant. Uncertain and fluctuating immigration policies and enforcement also contribute to unease. According to a 2017 Migration Policy Institute brief, three-fourths of people in the U.S. farm workforce were born abroad, and a significant proportion are undocumented. Deportation weighs heavily on the minds of workers and their employers. According to a study in the American Journal of Preventive Medicine, 65 percent of rural counties don’t have a psychiatrist, 47 percent lack a psychologist, and 81 percent have no psychiatric nurse practitioners. Meg Moynihan milks 70 certified organic cows at Derrydale Farm. 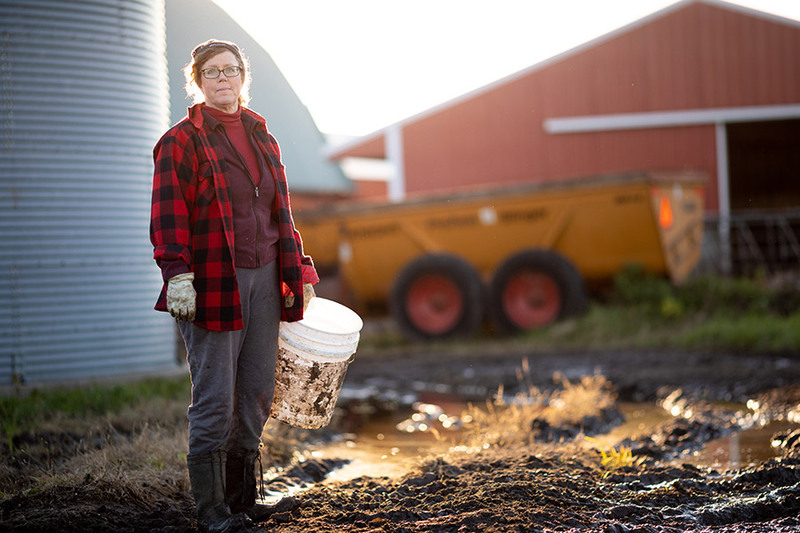 “Stress in a farmer’s life is extremely difficult to address,” she says. The human body can take episodic stress without much consequence, but chronic stress can produce real physical and psychological harm. Although stress does not always lead to depression and suicide, it is very often a contributing factor. To combat stress and its potentially lethal fallout, people have to acknowledge what they’re feeling. Doing so is difficult for people in the general population; for farmers, it can be a step too far. Moynihan consulted her doctor about her anxiety, but she is an exception. The 2018 American Psychological Association’s Stress in America survey found that 33 percent of Americans don’t talk to their health care provider about their stress. This problem is potentially exacerbated in rural communities and particularly among farmers, who view themselves as independent with a tradition of stoicism. “Stress in a farmer’s life is extremely difficult to address,” says Moynihan. The major and complicated endeavor to explore, understand, and ameliorate stress in agricultural communities demands that nearly every organization involved in farming play a part and, ideally, collaborate. Bringing people together around a critical issue is a UMASH specialty. The center itself is a partnership of the University of Minnesota School of Public Health and College of Veterinary Medicine, the Minnesota Department of Health, the National Farm Medicine Center at the Marshfield Clinic, and the Migrant Clinicians Network. Funded by the National Institute for Occupational Safety and Health, it concentrates on farmers, farm workers, and their families in five states. About five years ago, UMASH began to realize that it may need to tackle stress in farm country with the same rigor and focus it applies to any other work-related health and safety issue in agriculture. The team began to notice that stress and mental health were frequent topics of discussion in agriculture circles. 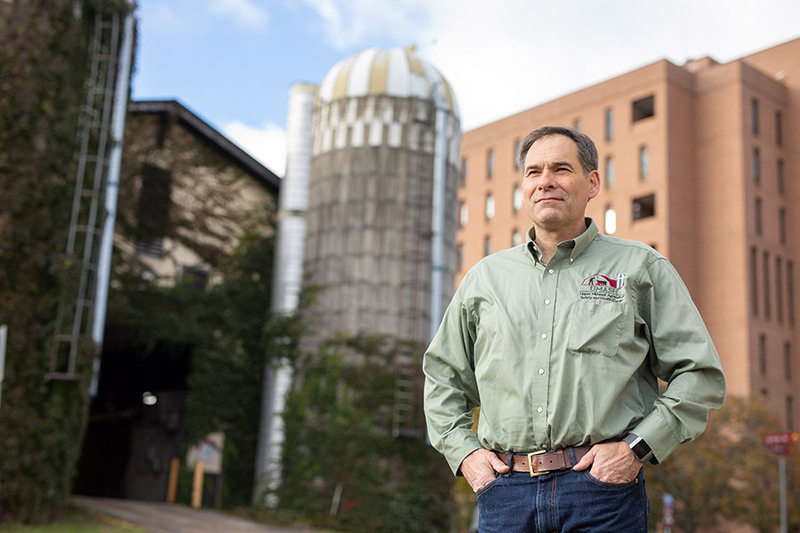 UMASH director Bruce Alexander realized that the center needed to tackle stress with the same rigor and focus it applies to any other farm-related health and safety issue. Recently, SPH Professor Pat McGovern, through a UMASH-funded pilot project, evaluated some of the social and mental health consequences of the highly pathogenic H5N2 avian flu in 2015. Farmers, farmworkers, and government officials experienced incredible stress, and some farm families whose flocks came down with the virus felt socially isolated, even ostracized, because others were worried about them spreading the virus or blamed them for allowing it to happen. At Farmfest in 2017, UMASH noted mental health seemed to be a common topic. It hosted a panel to discuss farm safety and health, which included a farmer who talked about the impact on his farm operation of losing his leg after it was caught in a silo auger. He struggled to get back to farming, to hold it together emotionally, and to keep his farm, he said. In the process, he lost his relationship with his wife. In collaboration with the Minnesota Department of Agriculture, UMASH convened a forum in June 2018 called Building Resilient Agricultural Communities. Along with farmers and farm workers, the forum brought together people from health care, public health, government, higher education, extension services, faith-based organizations, philanthropies, and financial institutions with their diverse perspectives on stress and its impact on the agricultural community. The goal of the forum was to identify challenges around stress and mental health outreach and support in agricultural communities, and to look for opportunities to create partnerships that could develop innovative strategies for building community-based resilience and support. It is not uncommon with all-day forums for more than half of the people to leave after lunch. Not so with this one. The intensity and critical nature of the conversation kept people in their seats. Out of the forum came three UMASH and community partnerships. One is a project with Ag Health & Safety Alliance, a global organization that develops innovative educational programs for post-secondary students studying agriculture. It’s creating a teaching tool to reach the next generation of farmers who are not only struggling with their own stress, but also the stress and mental health issues of their family members. Another is led by the National Alliance on Mental Illness (NAMI) Minnesota and focuses on normalizing stress by creating personal stories of farmers or farm families living with depression or being a suicide survivor, and sharing those stories. The project will also collaborate with agricultural communities to raise awareness of mental health resources. The NAMI project hopes to connect with more than 400 people in key Minnesota agricultural counties that also have high suicide rates. A third project, Cultivating Resiliency for Women in Agriculture, will collect data on farm women’s mental health and psychological well-being, a little-researched population, and offer virtual telehelp/webinar sessions. The resources for all three projects, plus a tremendous amount of information on stress and its impact, are aggregated on a UMASH web page dedicated to the issue of stress. Included is the number for a farm and rural 24-hour helpline (833-600-2670). According to Moynihan, one of the things UMASH is doing so well is shining a light on stress and re-framing it as another health and safety challenge on the farm, making it a little easier for farmers to seek help. “And when the organization giving those messages is one that farmers trust and are used to hearing from, as UMASH is, they’re more likely to listen,” she says. Alexander worries about immigrant workers and the effect stress has on them and their families, and he knows that UMASH and its partners need to do more for this population. Stress is a difficult feeling for American farmers to accept and take steps to manage; for migrant and immigrant workers, who provide more than half the labor on U.S. dairy farms, for example, both actions are nearly impossible. Agricultural workers and their families “don’t have ‘relaxation’ as part of their vocabulary,” says Gloria Contreras of Manos Latinas in a recording from the UMASH forum. Depression and anxiety are common in the community and seeking help is extraordinarily difficult for a variety of reasons, including cultural, economic, and practical. “The truth is that it’s hard to find a psychologist who is bilingual and it’s even more difficult to find someone who understands our culture and the factors that cause stress in our community,” says Contreras. Plus Latino agricultural workers, she explains, consider it a luxury of time and money to seek health care. It would be an even bigger luxury to get mental health care. In Spring 2019, UMASH will approach this issue among immigrant workers on dairy farms in Minnesota through a project called Promoting Safety and Worker Health for Immigrant Dairy Workers. A previous UMASH project (Seguridad en Las Lecherias: Immigrant Dairy Worker Health and Safety) was operating in Wisconsin in partnership with the National Farm Medicine Center, Migrant Clinicians Network, and the Consulate of Mexico. Over a 5-year period until 2016, it served 836 workers on 67 farms and trained and supported 52 community health workers. The new program will add mental health resources to its health and safety outreach work, as it joins with Community Health Services, Migrant Clinicians Network, and the University of Minnesota Medical School. “With this program, we’re being responsive to the needs of immigrant dairy workers who often don’t have the access to mental health support structures that others do,” says director Jeff Bender, School of Public Health professor and UMASH co-director. When UMASH and its partners work to ameliorate stress in the agricultural community, they face serious national issues. One is a drastic shortage of mental health professionals in rural areas. According to a study in the American Journal of Preventive Medicine, 65 percent of rural counties don’t have a psychiatrist, 47 percent lack a psychologist, and 81 percent have no psychiatric nurse practitioners. And funding for mental health support has been challenging to secure. In response to the current crisis, U.S. Congressman Tom Emmer (R-Minn.) sponsored a bill called Stemming the Tide Of Rural Economic Stress and Suicide Act, or STRESS Act (H.R. 5259), in March 2018. When the Farm Bill was finally signed into law in December 2018, it contained a version of Emmer’s bill and authorizes the appropriation of $10 million for each fiscal year 2019 through 2023 to be used for training programs and workshops for advocates and other individuals who assist farmers in crisis. Addressing stress and mental health is not a part of the UMASH mandate, and how much longer it can continue to devote time and resources to this critical issue is undetermined, says Alexander. But, as of now, the center has widened the conversation and helped create important partnerships across the agriculture community to move farmers, farm workers, and their families toward greater health and well-being.